The Chevrolet ASTRO III Gas Turbine Prototype was exhibited at the 1969 Chicago Motor Show. The General Motors Firebird Gas Turbine prototypes were introduced between 1952 and 1958. Gas Turbine Propulsion was considered a serious alternative to the Internal Combustion Engine as it appeared with success in the Aircraft propulsion. The Chevrolet ASTRO III Gas Turbine Prototype was a sleek, two-passenger experimental car similar to an executive jet aircraft with a tricycle-type wheel arrangement. The front wheel was indeed made of two wheels mounted side by side on a common pivot so that the Chevrolet ASTRO III was in effect a four wheel vehicle. 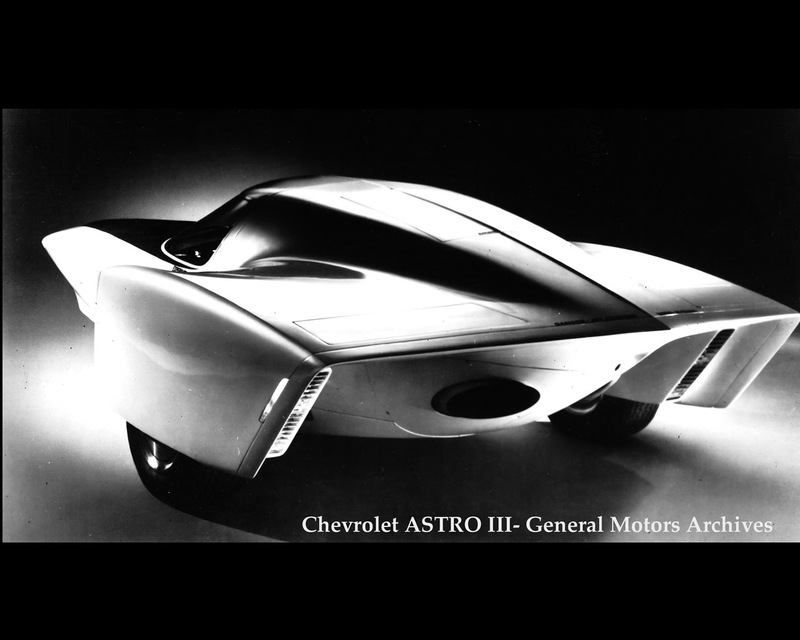 The Chevrolet ASTRO III Gas Turbine Prototype was conceived as a high-performance vehicle suited to travel on restricted access systems-controlled interstate highways of the future. The gas turbine is placed behind the passengers and propels the rear wheels by means of a two-speed Hydra-Matic transmission. It is a Type 250-C18 gas turbine made by Allison Division of General Motors. This particular gas turbine weights only 62 kg (139 lbs.) and produces 317 hp. It is produced for the propulsion of civil and military helicopters. The two seats Chevrolet ASTRO III gas turbine prototype is equipped with closed circuit television system for rear view vision. Access to the seats is made possible by a power-actuated canopy. Most driving controls are operated by pistol grip levers in place of a conventional steering wheel. The Chevrolet ASTRO III Gas Turbine Prototype was developed under John Z. DeLorean as Chevrolet Chief of General Motors Chevrolet Division. 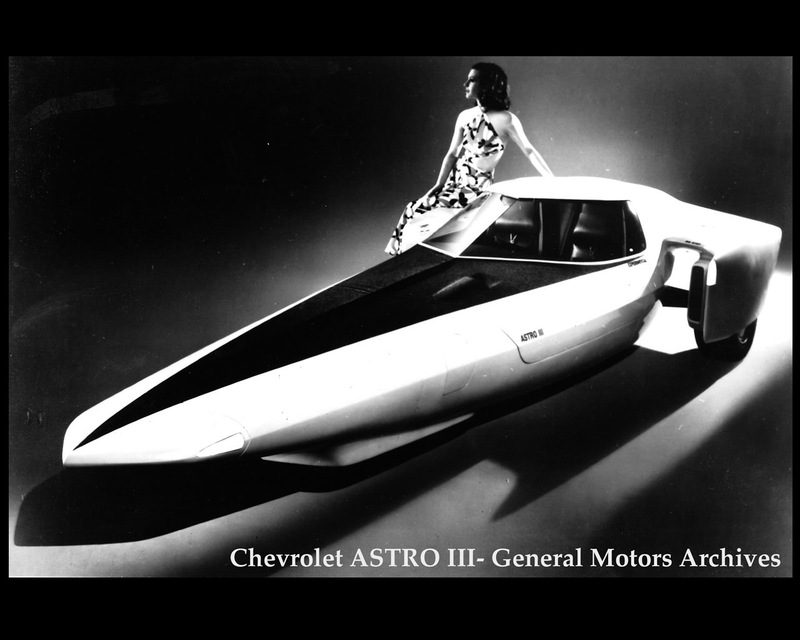 At the 1969 Chicago Motor Show, John Z. DeLorean explained that ASTRO III was part of an investigation for individual mobility using gas turbine propulsion. The tricycle wheel arrangement requires a very low centre of gravity to ensure stability. This solution was seen again in 2012 at the 24 Hours of Le Mans with the Nissan DeltaWing. In this case the adoption of such solution was intended to lower weight and thus reduces fuel consumption.